Regenerative medicine is the process of using the patient’s own cells to concentrate naturally made factors that promote healing. These cells create living functional tissue used to repair or replace tissue or organ function that was damaged by disease or injury. Because these cells are autologous (from the patient themselves) they are well accepted and have minimal if any side effects. By harnessing the power of the patient’s own cells we are able to treat a myriad of injuries. The goal is to return the tissue back to its original condition. 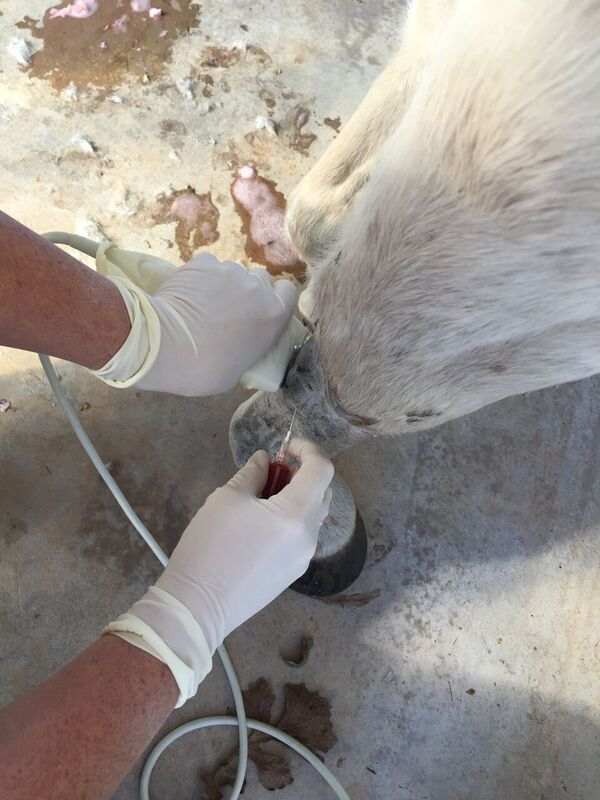 Osteoarthritis is a common cause of lameness and poor performance in horses. Osteoarthritis causes changes in the cartilage, and inflammation of the synovium (joint lining). This inflammation releases IL-1, Interleukin-1 (an inflammatory mediator) leading to further cartilage damage and increased production of IL-1. This becomes a vicious cycle leading to increased pain, inflammation and joint damage. IRAP (Interleukin-1 receptor antagonist protein), also referred to as Autologous Conditioned Serum, is a natural product harvested from the horse’s own blood. IRAP works by preventing IL-1 binding to the IL-1 receptors in the joint. This blocks the damage and inflammation induced by IL-1. IRAP treats the cause of the disease making IRAP a disease modifying treatment as well as an anti-inflammatory. It can be very helpful in the treatment of osteoarthritis and other inflammatory conditions, as well as in the post-operative period after joint arthroscopy. It can be used as the initial treatment of osteoarthritis, in patients that are no longer responsive to traditional joint injections, and in patients that corticosteroids are contraindicated as with metabolic diseases. 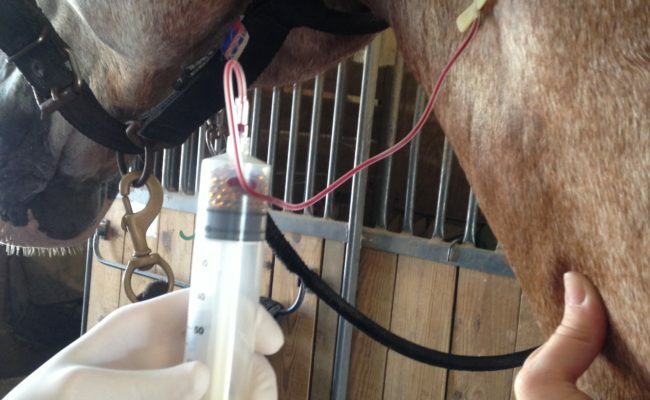 We harvest IRAP by drawing your horse’s blood into a specialized syringe that creates an environment to stimulate production of the anti-inflammatory proteins. The syringe is incubated for 24 hours then centrifuged to separate the serum from the red blood cells. It is then divided into individual dose syringes, for three to five doses total. The serum is stored in the freezer until it is ready to be used. Once processed, IRAP is injected in a sterile manner directly into the arthritic or inflamed joint. Injections are given 7-10 days apart typically for 3 treatments. Platelets are a natural component of blood. They are the first responders to injury, are important in clotting, and are rich in beneficial growth factors that aid in healing. PRP (platelet rich plasma) is a concentrated plasma that contains platelets, natural growth factors and bio-active proteins. Platelets provide growth factors that are released upon activation. This helps bring healthy cells to the area of injury, including those that contribute to new blood vessel formation, new connective tissue, and new skin growth. PRP can be helpful in tendon and ligament injuries as well as wounds. 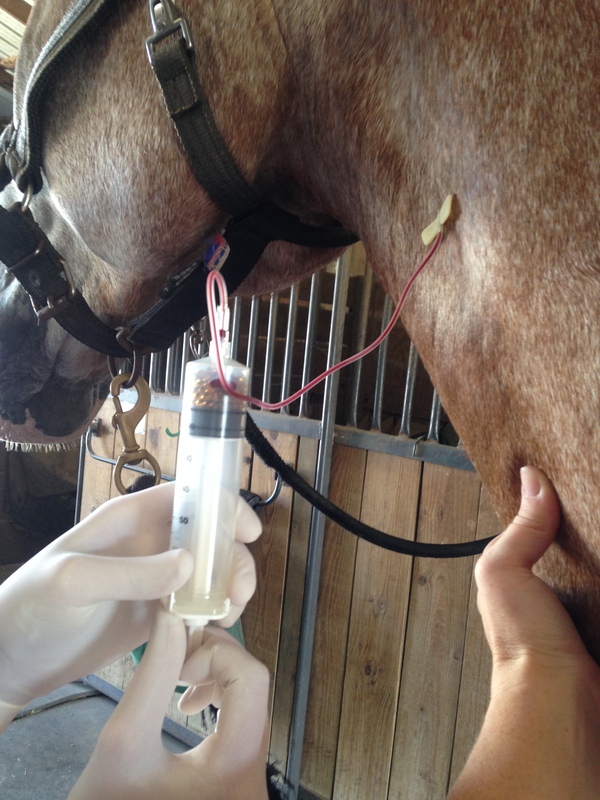 PRP is obtained by drawing the horse’s blood in a specialized system. The blood is then centrifuged to separate and concentrate the PRP from the other cells and the PRP is harvested from the sample. Once processed, PRP is injected directly into the tear (lesion) or applied to a wound. Tendons and ligaments are made up of dense connective tissue and have a limited blood supply, therefore injuries to these structures heal slowly and the repaired tissue is not as strong as the original. PRP is injected directly into the tendon or ligament tear (lesion) usually under ultrasound guidance. This can significantly reduce the time of healing and improve the quality of the tissue. 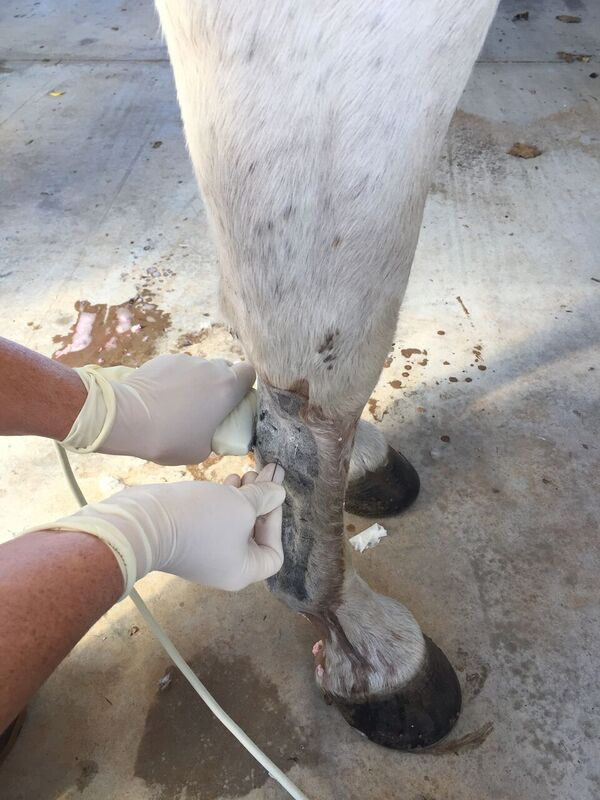 Horses are prone to large slowly healing wounds and wounds that produce excessive granulation tissue (proud flesh). PRP can be used in these wounds to speed up the healing process and improve the quality of tissue and skin in-turn decreasing the size of the remaining scar. For treatment of wounds PRP is activated to create a gel. This PRP gel can be directly applied to or injected into wounds. This PRP gel brings growth factors that aid in healing and skin growth and also provides a scaffold for new cells to grow on.